Structural Steel Market size was over USD 230 billion in 2017 and industry expects consumption of above 600 million tons by 2024. Increasing awareness among consumer about design and flexibility in construction materials is likely to stimulate structural steel market size in projected timeframe. Increasing use of product in construction of residential and non-residential building in Mexico, China, India, Japan and Middle East countries are major factor driving product demand. It offers properties including ductility, fire resistance, toughness and high strength, which intensify its usage in construction of pipeline, buildings, ships and bridges. Structural steels have extensive application in construction, transmission line towers and manufacturing sheds. These products are produced in numerous shapes including I-beam, angle (L-shape), hollow structural section (HSS) shape, Z-shape, and T-shaped. These products are considered as green construction material owing to its property of being able to be recycled and reused, continuous improvement in construction sector has led to the manufacturing of environmentally friendly products and reduced greenhouse gas emissions, thus propelling industry size. Rising ecological trepidations are encouraging governments, manufacturers and customers to use sustainable and nature friendly products, which is projected to escalates demand for structural steel. Manufacturers are developing technically advanced steel products which can help in reducing waste and scraps, which are prominent in case of wood. Buildings made by these products do not necessitate treatments for preventing decay, mold, and insect infestation, which is likely to drive product demand in the anticipated timeline. Structural Steel does not engross moisture, therefore cannot withstand any microorganisms that can have effect on the well-being of home’s habitants, thereby enhancing market size. These products are resistant to floods, earthquakes and snowstorms. Structural steel homes are resistive to flood and earthquakes, up to a magnitude of 7.9 on Richter scale, which is likely to drive product demand. Oil & gas projects surpassed USD 110 billion in 2017 owing to low cost for offshore development, improved gas demand and higher oil prices, which is likely to stimulate structural steel market size by 2024. China infrastructure spending was over USD 686 billion in 2017 owing to numerous initiatives by government for providing reliable electricity network, telecommunications, roads and rails, which is anticipated to rise the number of infrastructure project,which in turn stimulating structural steel market size. Global construction spending is likely to surpass USD 10 trillion by 2024.Government support is demonstrated in budgetary distributions for infrastructure projects and in beneficial regulatory reforms that are initiating new construction projects investment is likely to mount construction sector globally, thus expanding structural steel market size. Structural steel is an alloy of iron which makes it vulnerable to corrosion. The problem can be overcome using anti-corrosion products, due to which maintenance cost increases which may hamper its market size and industry profitability. Additionally, high fireproofing cost involved in product may affect product price trends. Structural steel market size from heavy sectional steel is estimated to surpass USD 78 billion by 2024. These products display superior features including high speed of erection, good seismic resistance, high strength, ease of fabrication, and excellent ductility. Increasing application scope in airports, data centers, healthcare facilities, big box retail stores, and manufacturing facilities is anticipated to foster demand for heavy sectional segment. Structural steel market size from reinforcement bar is poised to witness gains of up to 4% by 2024 owing to its increasing usage followed by the housing, and industrial segments. Reinforcement bar increase tensile strength of concrete assemblies in pillar structures, highways and bridges. Growing project tallies for bridges and highway are anticipated to fuel product demand in the forecast timeframe. Structural steel market size from industrial application may witness gains of up to 4%. Growing consumer spending and governmental investments in tourism, office buildings and retail space, and manufacturing facilities is anticipated to stimulate product market size. Industrial construction includes design, installation, and maintenance in factories and power plants, which requires high strength and sophisticated materials. thus propelling product demand. Asia Pacific, led by South Korea, Japan, India and China structural steel market is estimated to surpass 480 million tons in the estimated timeframe owing to growing consumer consciousness regarding safe construction. Rise disposable income in India and China and has led to an increase in urban development projects. Chinese government initiative to convert migrants in to urban citizens is likely to fuel construction activities, thereby driving regional industry growth over the forecast period. Europe, led by UK, Italy, France and Germany structural steel market size may record gains over 4%. Growth in residential, non-residential and civil engineering along with upgradation in construction and renovation will drive product demand in this region. Improving financial situation of the region will allow for stronger public investment in construction, which is anticipated to boost product market size in the projected timeframe. 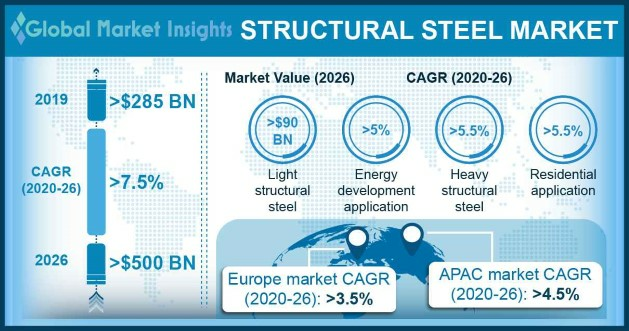 Brazil structural steel market size may observe strong expansion due to growing industries and swift urbanization which will prompt construction sector, thereby propelling product demand. Need for housing developments and improved infrastructure is projected to drive product demand in the region. 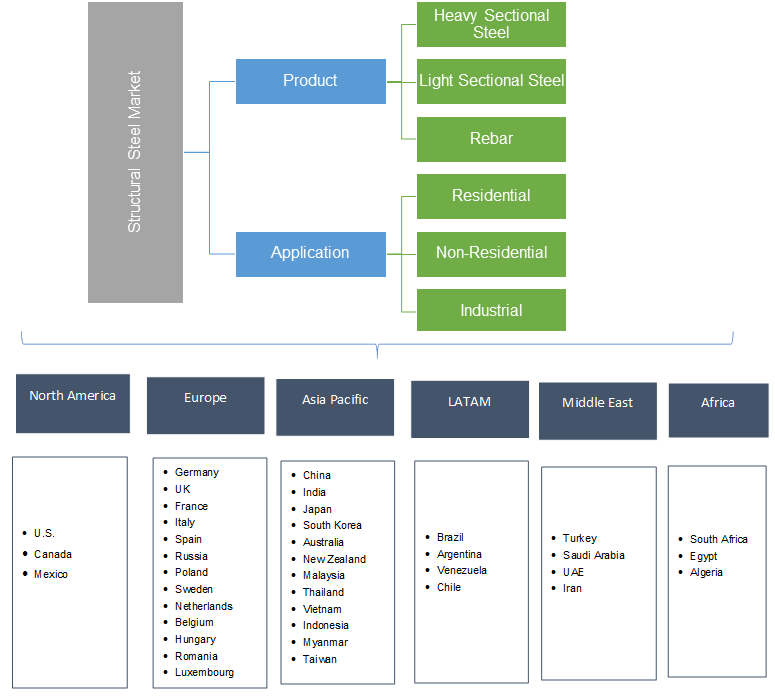 Global structural steel market share is moderately fragmented and competitive with major manufacturers include Shagang Group, Hunan Valin, ArcelorMittal, Nippon & Sumitomo Metal Corporation, POSCO, Evraz Group and Tata. Manufacturers are currently focused on joint ventures and mergers & acquisitions to enhance their market presence. Companies are investing in research & development for technical progressions, cost minimization and production maximization. Structural steel has application designing and buildings owing to its high strength to weight ratio that makes it ideal to be used in construction structures including bridges, buildings, warehouses and factories. Plates, girders, bars, beams, frames and columns are produced by manufacturer which are used in the construction industry. Major industry players are projected to integrate their business operation including extraction, processing, and distribution, thus stimulating product demand by 2024.